The oral cavity is a complex arrangement of bone, muscles, and nerves. 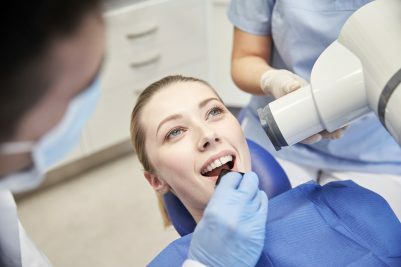 In order to find any ongoing periodontal issue lingering in the cavity that remains invisible to the naked eye, dentists make use of radiography. Many folks, who haven’t gone through that diagnosis procedure earlier, remain apprehensive about it. We want to assure our readers that dental X-ray is just like another regular dentistry task for seasoned dentists. Moreover, in this blog, we will try to put a short guide of dental X-rays for patients so that they can better prepare for it. Dentists prescribe their patients dental X-rays for multiple reasons. Dental X-rays is a safe medical practice amid the involvement of radiations. Various factors make dental radiography a risk-free procedure. The absorbed dose of dental X-rays is really low as compared to radiographic imaging of other parts of the body. Digital development of the dental X-rays results also minimizes the exposure to radioactive X-rays. Except for mouth, the body (chest, abdomen and pelvic region) of the patient is covered by specialized bib made of lead. The element has the innate ability of blocking radioactive rays. Pregnant women are advised to avoid getting any type of X-ray. So, Dental X-rays are also not usually conducted during pregnancy. No formal preparations are required prior to dental X-rays. It would be enough to brush your teeth before visiting the dentist for dental X-rays. Dental X-ray is usually of two types: intraoral and extraoral. In most of the cases, intraoral X-rays are conducted. There are four subtypes of intraoral X-rays. This type of dental X-raying is used to observe the matching up of the teeth crowns for identifying any cavity in between. In order to get the desired result, patients are required to bite down on a particular stuffed piece of paper. As the name suggests, this intraoral X-raying involve machine rotation around the head. This dental X-ray is carried out to detect the growth of wisdom tooth and to examine any ongoing jaw problem. Dentists also carry out panoramic dental X-rays before commencing the dental implantation. This intraoral X-ray is carried out to identify any anatomical abnormalities affecting the palate. The occlusal X-ray is conducted with closed jaws to see how upper and low teeth assembly is lined up against each other. This intraoral X-ray technique is also employed to get the radiograph image of all the teeth in one shot. This technique entails radiography of the whole teeth from root to crown. Extraoral X-raying, on the other hand, is usually conducted to identify oral problems not related to gums and teeth. Getting regular dental X-rays is a part of a good oral health regimen. Paul Mansky DDS can provide all the relevant expertise including dental X-rays that are necessary to ensure good periodontal health. Call us today at (248) 689-5508.